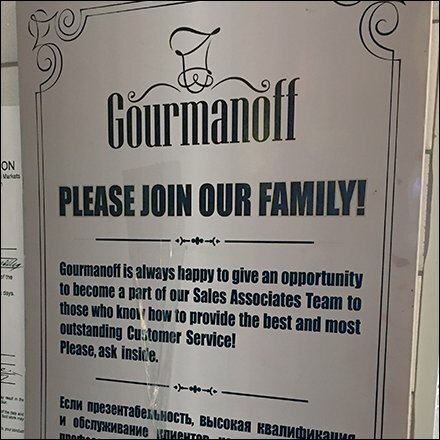 Interesting that this Please Join Our Family Gourmet Hiring Appeal was in English first then Russian, for my wife and I have found little English among the Gourmanoff staff (No criticism intended). Then again, the speak-Russian-first fits well in Little Odessa, the Brighton Beach district of Brooklyn. And the Russian also impresses us tourists, and adds cache to this ethnic gourmet grocery. But I am lucky. In a pinch I can ask my wife to translate and speak for me. I know little more than Spaciva, and Nasdrovia.